(Leah Hogsten | Tribune file photo) Senator Orrin G. Hatch and The Orrin G. Hatch Foundation announced Wednesday, May 2, 2018 of a formal partnership with the University of Utah to erect a new facility to house Senator Hatch's archives from his 42 years in the Senate as well as offer forums to help train future leaders and discussions of policy. The new facility will be located across the street from the Thomas S. Monson Center at 411 E. South Temple and will honor the legacy of Utah's long-serving senator who is retiring early next year. Fundraising is now underway on a $40 million library and think tank in honor of retiring U.S. Sen. Orrin Hatch, R-Utah, to be located on South Temple in Salt Lake City. But one of the candidates vying for Hatch’s seat had harsh words for the project Wednesday, dismissing it as an “offensive” example of how Utah’s political elite, and Hatch in particular, is out of touch. Wilson also questioned the center’s purported mission of promoting political civility and bipartisan cooperation. That goal is a “joke," she said, given Hatch’s role in denying Senate consideration to President Barack Obama’s final Supreme Court nominee, Merrick Garland, and disparaging comments the longtime Utah senator has made about the Democratic Party. This year, Hatch has used the phrase “dumbass” to describe supporters of the Affordable Care Act, or Obamacare, and more recently to criticize the efforts of his Democratic Senate colleagues to vet Supreme Court nominee Judge Brett Kavanaugh. “We can’t keep going down this partisan, picky, stupid, dumbass road that has happened around here for so long,” Hatch said earlier this month at a news conference. Utah has a number of pressing issues in need of financial support, Wilson said, such as the state’s inordinately high youth suicide rate, domestic violence, opioid-related deaths and underfunded public schools. Those efforts are more worthy of support than the Hatch Center, she said. She also objected to her opponent in the Senate race, Republican Mitt Romney, participating in Monday’s fundraising launch for the center at the Deer Valley ski resort in Park City. Hatch has said that he recruited Romney to run for his seat, and the former Massachusetts governor and presidential candidate is generally expected to win the seat in November. 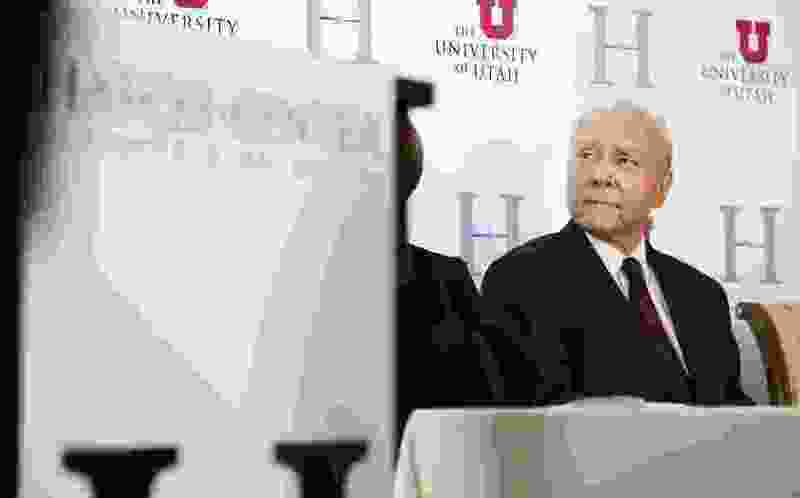 While rumored for some time, the Hatch Center was formally announced in May at a joint event by the Orrin G. Hatch Foundation and the University of Utah. The U. agreed to sell its parking lot at 411 E. South Temple, across from the school’s Thomas S. Monson Center, for its construction, and to partner with the center through the U. 's Hinckley Institute of Politics and Kem C. Gardner Institute. On Wednesday, U. spokesman Chris Nelson declined to comment on Wilson’s remarks, but added that the Hatch Foundation, and the future Hatch Center, are entirely independent of the University of Utah. Hatch’s office did not respond to a request for comment, as did Romney’s campaign. But Trent Christensen, director of the Orrin G. Hatch Foundation, reiterated the goal of the center in an email. Correction: Aug. 15, 2018, 8:08 p.m. • An earlier version of this story misstated the title of Trent Christensen, who is director of the Orrin G. Hatch Foundation.